IMPOSTERS - One of my favorite novels, mentioned here before, is Billy Phelan's Greatest Game, by William Kennedy. The title character, Billy Phelan, is a gambler cruising the nightlife of 1938 Albany, an adept at bowling, pool, and poker, a romantic fictional character any reader would aspire to be. It is in that same guise, as a fictional character, that I have always come to S. W. Erdnase's The Expert at the Card Table. That is, despite the fact that I have indeed cheated at cards (for the thrill of employing the spread) and have over many decades learned and performed impressive gambling demonstrations concocted by various genius conjurors, I have never aspired to nor acquired the skills that "the most critical observer would not even suspect, let alone detect." Rather, I approach the techniques in Erdnase as methods that could be used by an imaginary version of myself: my hands as talented as those of Steve Forte, my looks and demeanor as cool as those of Steve McQueen in The Cincinnati Kid. Erdnase is the stuff of dreams. It might be argued that Erdnase himself was a fictional character. We know his name was. David Ben's bold decision to list his fellow author as E.S. Andrews was recently challenged by yet another candidate this month on the Genii forum, raising the list of possibles to thirteen or so. I have always suspected that the gambler himself was also a fiction, that "Erdnase" was far more a writer than a card cheat. Perhaps this is because I likened the book to my first book on the subject, Poker According to Maverick. To a kid in the late fifties, Bret Maverick seemed the real deal. Whatever, Erdnase's gift for language is compelling, and he has coined some of the most famous aphorisms in magic. All of which brings us to the book at hand, The Experts at the Card Table, by David Ben and what's-his-name. Some fourteen years ago, David got the idea to reshuffle the text of Expert (the Card Table Artifice portion) so that it would provide a step by step roadmap for the card mechanic who wanted to sit in on a game and fleece the marks. The results are surprisingly effective. Simply by rearranging the order of the instructions and setting some off as sidebar commentary, David has made the once-daunting material more accessible than ever. For my first time, I read the text cover to cover, and it all made sense. Previous attempts with the original caused my eyes to glaze over. Also of enormous benefit is the new layout, with dozens (more than 101) of photos replacing the Marshall Smith drawings. (The hands in the photos are David Ben's; the retro-look photos are by Julie Eng.) The design is attributed to Julie, Kevin McGroarty, and Michael Albright. I am not quite sure what Kevin did, but have long loved Michael's work. He could make the phone book look like a high-end coffee table book. And yes, that is just what this book looks like. The book lies open flat, so that you can work through it with cards in hand, which I did (further underscoring the fiction of my becoming an ace card cheat). A look at the New Order: The Introduction and Chapter 01 Primary Accomplishments contain many of the dictates Vernon was fond of quoting. Chapter 02 Locating, Securing and Stocking Cards provides a riffle cull and other means for placing desired cards at the bottom of the deck. (Erdnase: "These cards might be left on top, but they would be of little use there." My fictional self enjoys knowledge of the top cards. Cut the deck to the right and riffle shuffle, peeking the last card that falls from your left thumb. Repeat, peeking the next last card that falls from your left thumb. You now know the top two cards. Do it twice more, and you know the top four cards. Deal a five-handed game of Five Card Stud, and you know all the hole cards. Yes, you have to "circumnavigate" the cut, but Erdnase supplies strategies for that.) Chapter 03 Blind Shuffles supplies riffle shuffle techniques for maintaining the top or bottom stocks. 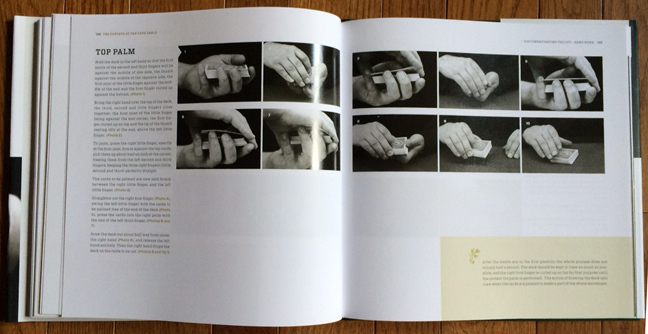 Chapter 04 Blind Cuts offers numerous methods for the cutter to use. Chapter 05 Circumnavigating the Cut: Table Work yields methods by which the dealer acting alone can nullify the cut or by working in collusion with an ally. Chapter 06 Bottom Dealing now makes use of those cards you secreted at the bottom. Chapter 07 Hand Work is an extensive Erdnase look at overhand shuffles. 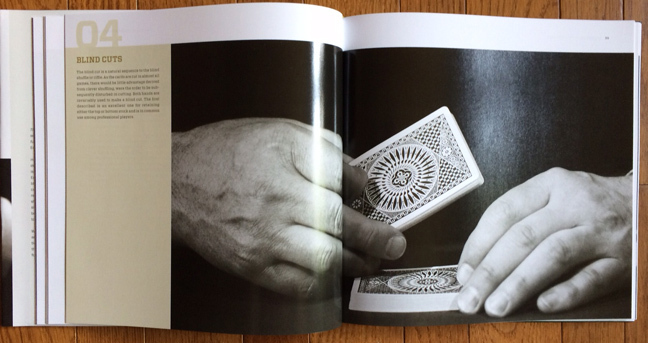 Chapter 08: Circumnavigating the Cut: Hand Work teaches top and bottom palms to that end. Chapter 09 Stock Shuffle and Chapter 10 Erdnase System of Stock Shuffling cover methods for setting advantageous cards to be dealt to the dealer (or ally) via overhand shuffles. (Important line: "The highest tribute that can be paid to the method is the fact that certain payers whom we have instructed, can execute the stock with the greatest facility ..." Has anyone discovered any Erdnase pupils in the search for his identify?) Chapter 11 Erdnase System of Cull Shuffling describes what to do when you note that there are advantageous cards at, say, positions 7, 5, and 9. Chapter 12 Additional Advantages gives an overview of collusion, dealing extra cards, skinning the hand, holding out, and second dealing. Chapter 13 Three Card Monte covers the classic game, and Chapter 14 Technical Terms defines terms used throughout the book. David promises that this book is one of a trilogy. The second will address David's thoughts on the material in the first, and the third will address gaps in the first, with new developments by Dad Stevens and Dai Vernon. The Legerdemain section will not be addressed. This is a lavish production, sure to be a must-have purchase by students of Erdnase. Foreword by Karl Johnson, Commentary by David Ben, Preface by (?) E.S. Andrews. $75 plus $6 shipping from Magicana.